India have won six One-day International series in a row this year, including the Champions Trophy tournament in the UK. Patiala lad Karan Kaila is gearing up for a dream debut for India as he was selected in under-19 squad for the ACC Asia Cup, to be held in the UAE from December 28. Gaganjeet Bhullar carded a flawless seven-under-par, 64 to lead the Indonesian Open, being played at the par-71 Pantai Indah Kapuk golf course in Jakarta this week. A sportsperson can only be grateful to God if he returns after five long years and picks up a five-wicket haul in the comeback match. VRV Singh, the Punjab seamer, sounded full of gratitude after his successful comeback from almost the point of no-return. “It’s all His blessings, I can’t be thankful enough,” said VRV. Manchester United qualified for the knockout phase of the Champions League with a thumping 5-0 win at Bayer Leverkusen. Vani Kapoor and amateur Gauri Monga kept the Indian hopes high, both shooting one-over 73 to end the first round in tied 13th position in the $300,000 Women's Indian Open on Thursday. India have won six One-day International series in a row this year, including the Champions Trophy tournament in the UK. This number is unprecedented, prompting the question — is MS Dhoni’s current team the best Indian ODI side ever? In the 2010s, the Indian team’s victory rate is 66 percent, with 69 wins from 109 matches. In this duration, India won both the World Cup and the Champions Trophy. This success rate of 66 percent is much above India’s overall victory rate of 53 percent. 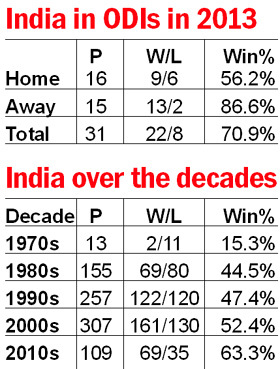 In the 1970s, India won 15 percent of the ODIs they played; in the 1980s, this rose to 46 percent, and to 50 percent in the 1990s. In the 2000s, the win percentage was 55 percent. Thus, the trend of greater success for the team in ODI cricket continues in the 2010s. Winning six ODI series in a row is another grand success, unprecedented for the Indians. India have won 22 of the 31 ODIs played this year, for a victory rate of 73 percent. However, delving deeper into the statistics brings out other facts. In bilateral or three-nation series this year, the success was built around playing, one, mostly at home; and two, against modest opposition abroad. The opposition in the bilateral series was so weak that India’s victory rate abroad this year ballooned to 86.66 percent. At home, the win rate this year is a relatively modest 60 percent. This year India beat England 3-2 at home, then won the Champions Trophy in the UK without a single loss. They then won the tri-series involving West Indies and Sri Lanka in the West Indies. India also beat Zimbabwe in Zimbabwe 5-0, and Australia 3-2 and West Indies 2-1 at home. India played 15 ODIs away from home, winning 13. The relatively easy wins were against West Indies and Zimbabwe (6 in total). There were also two wins over Sri Lanka in the West Indies. India’s more difficult wins, due to tougher opposition and conditions, came during the Champions Trophy, over Pakistan, South Africa, West Indies, Sri Lanka and England. Clearly, India’s crowning glory this year was the Champions Trophy. But while this year’s numbers are very impressive, the current Indian team is hardly the country’s best ever ODI team. The Indian team of 1983 or 1985 won away big tournaments away from home – the World Cup, Asia Cup, Rothman’s Cup and the Mini-World Cup. Sourav Ganguly’s team of 2003 team reached the World Cup final in South Africa, which was quite a feat, as was victory in the CB Series in Australia in 2008. The Indians in 2013 have been very strong. To be rated among the greats, though, they must achieve greater successes in conditions they’re unaccustomed to, away from home. An opportunity to do that would present itself soon enough, on the tour of South Africa. The left-arm spinner had an excellent stint in the recently concluded Veenu Mankad Trophy, as captain of winners Punjab. Talking to The Tribune, Kaila, an undergraduate at Modi College, Patiala, said that he was confident that he would perform well in the Asia Cup and justified his selection. "I have been bowling well and my batting has also improved in the recent past. The Asia Cup experience will help me enhance my skills in the limited overs format. The slow wickets in UAE are tailor made for spinners," said Kaila, who is a product of the Black Elephant Cricket Club. Ecstatic with Kalia's selection, his coach Hardit Arora said that the southpaw was always a hardworking cricketer. "His unbeaten half-century in the Veenu Mankad semifinal against Uttar Pradesh was a sound knock that took Punjab into the final, which they won under his captaincy." Punjab's under-19 coach Sunil Saggi praised Kaila, saying that he performed well in pressure situations and was capable of bowling 30 overs at length. "He is a brilliant runner between the wickets and a superb fielder," said Saggi, who was the one that backed Kaila for Punjab captaincy. Seventeen-year-old Ankush Katkar Singh Bains has cemented his place in the India-U-19 side with his talent and promise. The right hand batsman and wicketkeeper from Hamirpur has made it to the Indian team for the ACC U-19 Asia Cup. He played one of his best knocks, of 134 (89 balls), against Zimabwe U-19 in the Quadrangular series in September. Ankush trains at Delhi's RR Gymkhana under coach Shravan Kumar. The young gun made his debut in the Ranji Trophy against Jammu and Kashmir a fortnight ago but could not recreate the magic. Ankush is a floater in the playing eleven and can open the innings with equal ease as playing in the lower middle order. The ability to accelerate quickly is his forte. Gaganjeet Bhullar carded a flawless seven-under-par, 64 to lead the Indonesian Open, being played at the par-71 Pantai Indah Kapuk golf course in Jakarta this week. He had a sedate start to his round teeing off from the tenth and was two-under-par at the turn due to birdies in 13th and 14th holes but suddenly caught fire and made five birdies on the trot from the fourth till the eighth holes. A par on the last saw him end the round with a two stroke lead over his nearest competitor. “The way I was striking the ball from the first tee, I knew I could go low. Once my putts started falling, that’s when I went really low,” said the four-time Asian Tour winner. Meanwhile local golfer Sujjan Singh also carded a bogey free four-under-par, 67 to lie at joint eighth alongside inform Thongchai Jaidee of Thailand. Amongst the other Indians Jyoti Randhawa shot two-under-par to occupy 22nd place. Abhinav Lohan carded a 70, one-under-par to tie for 30th place. Indian born, American based Daniel Chopra had a great start to his round and was four-under-par through 12 holes but had a few late round hiccups and finished with a score of even-par, 71. Meanwhile, Anirban Lahiri who enjoyed a decent outing at the World Cup managed three birdies against three bogeys to stand at even par. SSP Chowrasia ended the day at one-over-par as did Shiv Kapur. Given that he played his last First Class game in 2008 and spent the next five years hurtling from one injury to another and then waiting for them to heal, it’s easy to understand that overwhelming note of gratitude and relief in his voice. “It of course feels great to pick up five wickets on returning after a long and forced absence. I am as much delighted as relieved... but the job is not yet done. We need bowl well in the second innings and win the game for Punjab,” he said. Even with the last five years being the most forgetful of his career, he just couldn’t help but look back even as began his second innings on sparking note. “It’s been a very tough time for me. Injuries just kept coming... it started with a foot injury, then ankle and then the back trouble for which I had to under the knife. It was a harrowing time but somehow I managed to stay positive, hopeful that I would get a second chance,” he said. But even staying positive and hopeful wasn’t easy at that time. From being an India bowler one time, injuries pushed him back to the starting point – the inter-district matches. “It didn’t matter where I was playing as long as I was getting a chance to play. I played a few Katoch Shiled matches earlier this season to get some match practice and get my rhythm back. Thankfully, all went well for me,” he said. Having been dogged by injuries for so long, does the fear of picking up another injury haunt him? “I don’t think about it, actually you don’t think of anything but bowling well and winning the game once you are in the thick of the action,” he said. Having picked up five wickets and restricted Haryana to just 163, he has indeed bowled well. As for winning the match, it’s anybody’s game as Haryana had struck back to reduce Punjab to 50 for 3 by the end first day’s play. Continuing with his rich form with the ball, Himachal Pradesh skipper Rishi Dhawan picked up another five-wicket haul to bowl out Assam for just 81 runs. Himachal, in reply, were sitting pretty at 199 for 4, with Nikhil Gangta unbeaten on 43 and the skipper on 36. Brief scores: Assam 81 all out (Dhawan 5/29); HP: 199 for 4 (Sangram 40, Gangta 43 no). Despite being without Robin van Persie and Michael Carrick, the visitors put forth their best shift in the David Moyes era, although their opposition was as poor as they will face in Europe. Antonio Valencia converted Wayne Rooney’s cross to put United ahead, with an Emir Spahic own-goal doubling the lead. Leverkusen improved after conceding the second, with Stefan Reinartz hitting the post and David De Gea denying Spahic with the follow up. But the excellent Jonny Evans put any hopes of a comeback to bed, finishing from close range after the hosts failed to clear a corner. Chris Smalling added a fourth, with Rooney again the architect after a defensive error from Giulio Donati, while Nani rubbed salt in the wounds with a cool chipped finish after Ryan Giggs – who turns 40 this week – played him through. United qualify but, following Shakhtar Donetsk’s win over Real Sociedad, they must avoid defeat at home to the Ukrainians to win the group. Incredibly, Leverkusen can still go through if they beat Sociedad and Shakhtar lose at Old Trafford. Thailand's Thidapa Suwannapura and France’s Valentine Derrey stole the limelight with matching rounds of 66 for joint lead at the Delhi Golf Club (DGC) with 21 other golfers. Neha Tripathi, winner of the Women's Pro Golf Tour order of merit list this season, is a stroke behind Vani and Gauri in tied 36th position, while Sharmila Nicollet, the only Indian to have a card on Ladies European Tour, wasn't in her best form and shot a three-over 75 for 47th place. New Delhi: The Ministry of Youth Affairs and Sports has given an ultimatum to eight National Sports Federations (NSFs) to hold Special General Body Meetings (AGMs) to incorporate the Government guidelines on the Sports Code on age and tenure limits in their constitution. The NSFs, who have been asked to fall in line, are: Deaf games, fencing, handball, jump rope, karate-do, wrestling, wushu and yachting. The Ministry, in a letter to these eight federations, has asked them to submit the required documents by December 13, failing which they will face non-renewal of recognition for 2014 and stoppage of grants by the Government. Out Of 53 NSFs, only the above-named federations have not yet submitted the revised by-laws/ constitution incorporating the aforesaid guidelines in their constitutions. Bangkok: Serena Williams will play Victoria Azarenka in an exhibition match in Thailand next month in a matchup of the world's top two women's players. The Lawn Tennis Association of Thailand announced on Thursday that the match will be part of the regular invitational event in Hua Hin, a popular holiday destination southwest of Bangkok. Azarenka has twice played exhibitions matches there, while this will be Williams' first appearance. Sau Paulo: Two workers were killed on Wednesday when a crane collapsed at the stadium hosting the opening match of next year's World Cup of soccer, causing damage to the exterior and renewing questions about whether Brazil will be ready to host the event on time. Construction workers had been racing to finish the stadium in Sao Paulo, Brazil's biggest city, prior to a December deadline imposed by world soccer body FIFA. Andres Sanchez, a former president for the Corinthians soccer club who is helping oversee construction, told reporters that a crane collapsed while lifting a piece of the stadium's roof into place, sending the piece tumbling down. He said the cause of the accident was still unclear, adding that any possible delay to construction was "the least of our worries." New Delhi: Youth Asian Games champion Ragala Venkat Rahul (77kg) stole the show with half a dozen gold medals as India signed off with a whopping 87 medals at the Commonwealth Youth and Junior Championships which concluded in Penang, Malaysia today. In the senior men's division, Sivalingam Sathish Kumar (77kg) won three gold medals. The youth boys were the stars of the show with a combined tally for 13 gold medals. In fact, they were the biggest contributors to the tally with 21 medals in all. The youth girls contributed 18 medals. India signed off with a overall tally of 47 gold, 28 silver and 12 bronze medals at the event.